Congratulations to Pacific Northwest National Laboratory's Dr. L. Ruby Leung on being named an American Association for the Advancement of Science Fellow. The AAAS is the world's largest general scientific society and publishes the journal Science. The AAAS gives the distinction of Fellow to members who have made exceptional efforts to advance science or its applications. Leung will be recognized in February 2009 at the Fellows Forum during the AAAS national meeting in Chicago. Leung is a laboratory fellow in the PNNL Atmospheric Sciences and Global Change Division. She has received international recognition for discovering unexpected impacts of regional climate change, such as changes in water resources in the United States and East Asia. AAAS honored her "for outstanding contributions to the development and application of regional climate models." 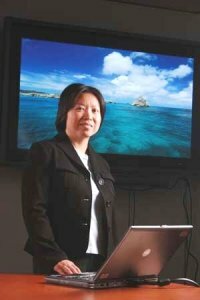 In the worldwide scientific community, Leung is known for modeling regional and global climate processes, integrating land and atmosphere models, and increasing the understanding of abrupt climate change. She contributed to scientific assessments done by the Intergovernmental Panel on Climate Change, which won the Nobel Peace Prize in 2007. In collaboration with organizations such as the National Center for Atmospheric Research and the National Climate Center of the China Meteorological Administration, Leung is developing a next-generation regional climate model that will help transform the world's ability to predict climate change and its impacts. Her research on climate change impacts has been featured in Science, Popular Science, Wall Street Journal, National Public Radio, and many other major news outlets.